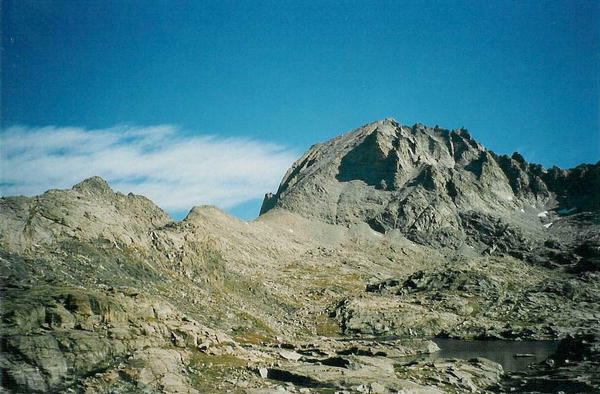 "The trek to the top of the Second Highest peak in the Wind River Range was going to take more then peer pressure by my good friend Hank, it was going to take stupidity. " It seemed like the thing to do this past summer. 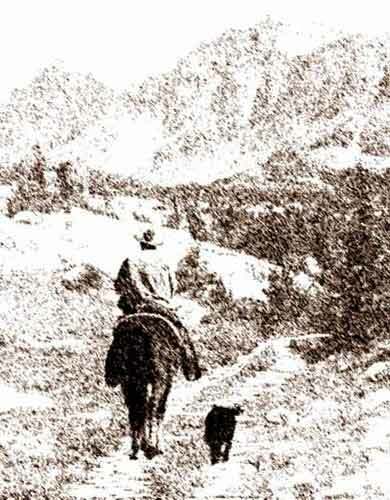 The trip to the top of Fremont Peak and back in one day had been featured in the local paper by three different climbers, but never did I think I should try such a crazy venture. I remember my folks talking to me about peer pressure when I was younger, but somehow this seemed different. 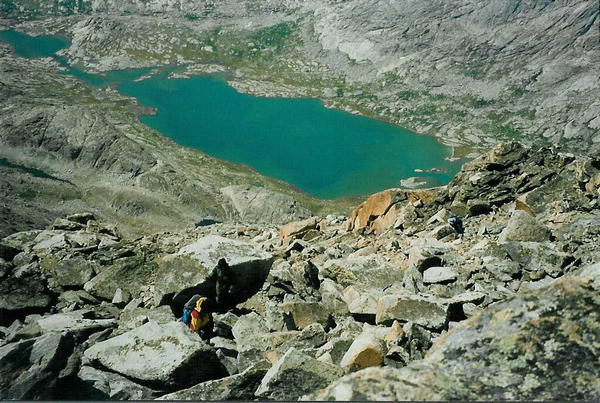 The trek to the top of the Second Highest peak in the Wind River Range was going to take more then peer pressure by my good friend Hank, it was going to take stupidity. Especially for a kid that sits behind a desk or in a car showing property all summer long. None the less, the alarm sounded at 3:30 am and I was out the door with as little as possible by 4. Hank, who was my great adventure partner and the instigator of all this foolishness, was waiting as I pulled up in front of his house. Of course Hank travels these mountains every chance he gets and is no stranger to 25-35 mile hikes in one day. He was scheduled to be along on one of the earlier trips in the summer, but a conflicting schedule left him looking for another partner and a new date. Some of you may not think much of 30 miles in one day, but when the guy you are following never picks up his head or stops to rest in the first 10 miles, you know you are in for a very long day. As we pulled up to Elkhart Park, which is a famous staging ground and access point for backpackers, the parking lot was full. August is always a great time to climb high and it looked as though we were going to have company along the trail. Obviously we were the only signs of life at 4:30 in the morning and it wasn't long until the headlamps were on and Hank set the pace that only a thoroughbred could match. Photographers Point was the first chance for me to remove some clothing and catch a breath and then we were off again. Like I mentioned earlier, I was packing as light as possible and as I looked to the West, the light was barely showing a clear blue sky which confirmed that I should throw my extra clothes behind a tree and keep on moving. I must admit that I rarely head to the hills on my own two legs but impressively enough we were setting record pace. By the time we neared Senaca Lake the sun was finally up and I had to stop for my first of many blister repairs. We soon broke over our first major hill while in the daylight and looking us straight in the face was the 13,885' peak that we had come to Conquer. It still looked a good distance away and Hank promised that he was going to climb with or without me that day so I pressed on. I guess this would be the appropriate time to mention that well over 2500 people have climbed to the top of Fremont over the years. Hank had also told me earlier that he knew of less than 10 of those who had climbed it in one day. I guess those statistics should have warned me to stay home. However, I thought it would make a great story to tell my kids when I got older which seemed to be accelerating fairly rapidly at this point. Of course I had never been past Seneca Lake before and so now that the sun was up the timing couldn't have been better for me to see some new country. Hank had promised that Titcomb Basin was "not far" and even though I felt his definition of "not far" was different than mine I stumbled on. When we topped the next ridge looking into the basin below Hank's small fib was easily forgiven. What a sight! 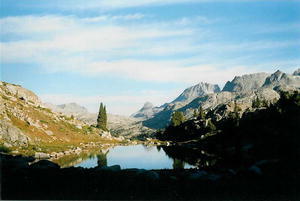 Now I knew why this was one of the most talked about destinations for backpackers in the Wind River Mountains. Needless to say I was impressed not only with the view but the fact that my partner had even stopped to acknowledge this spectacular vista which laid before us. We were both pleased with our progress thus far and took a minute to soak it all in and give our legs a rest. It wouldn't be long until we would be going vertical again. We dropped on around Island Lake and headed up into Indian Pass, which was the preferred route by all that climb the majestic peak. This was the point that I reached into my pack and broke out my very first Power Bar which I was told would get me to the top. Of course I now have my own opinion of this Calorie saturated flavorless energy booster and will probably have to be held at gun point to choke down another one. It was 9:00 a.m. as we began our march into Indian Pass and it looked like we were going to have some company on the mountain today. Four other climbers were just up ahead and had based from down at the lake like most normal people do. We soon realized that they were not familiar with the area and seemed to be picking a more difficult route than we cared to follow this early in the game. Of course my guide had a better sense and understanding for the terrain and I stayed close behind. By the time we reached the saddle in the pass and started our way up the first stage of Fremont, the mountain had taken on a different look. Everything looked steeper, longer, and rougher than I anticipated but there was no turning back at this point. 11:15 was the time of our initial accent and by the time we reached the top of the first bench we could see several other climbers who were just ahead. By this time the wind was really picking up and we passed one gentlemen who was coming down and complained of unsafe conditions ahead. Of course by this point we could "feel" the top even though we couldn't see it and we kept picking our way through the loose boulders. Scrambling is the term that the mountaineers use for this type of climbing and I now know why. You have to scramble to stay out of the way of rocks falling from the climber ahead of you. Hank is actually a very talented climber and I only had a few close calls as I tailed him up the face of Fremont. It wouldn't be long now as we made our final push for the Summit.